Artistic Director and choreographer, Sheena Annalise, at age 14, was honored to work with Wayne McGregor | Random Dance in “ Equator Project”, nurturing her choreographic talent. 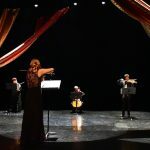 She quickly found a distinct voice by creating innovative body lines and exploring her fascination with the connection between movement and music. In her early work she began to play with creating her own tempos, accents, and pauses in her ballets without the limitations of existing music. 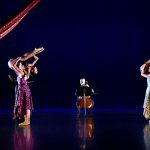 Looking to accentuate her silent yet rhythmic choreography, she developed her artistic process of commissioning artists to create music specifically to each repertoire program. Annalise spent 2012 mentoring with the Mark Morris Dance Group, when she then founded Arch Contemporary Ballet the following year. Through ACB she has received residencies and space grants throughout NYC and has been named a “Prodigy” by The Women’s Project. The talented Concetta Abbate is a NYC based composer, violinist, violist, and vocalist. She began studying classical violin and ear training at age 4, with Irene Lawton. After a childhood dedicated to classical training, Concetta became interested in folk tales, natural science, poetry in Spanish, and everyday objects and sounds. She has been described as a “badass violinist” by Garret Bryant (HINGED) and “Eerie, haunting ‘Chamber Pop” by the German music blog Kulterwelt. Her diverse performance venues include The East Indian Music Academy, the Rubin Art Museum, The Eastman School of Music, The Tilles Center, Cornelia Street Cafe, Columbia University, the Jazz Gallery and The Stone. She was recently a visiting composer in residence at TAKT gallery in Berlin in 2014 and will be returning to teach a workshop on music composition in 2016. 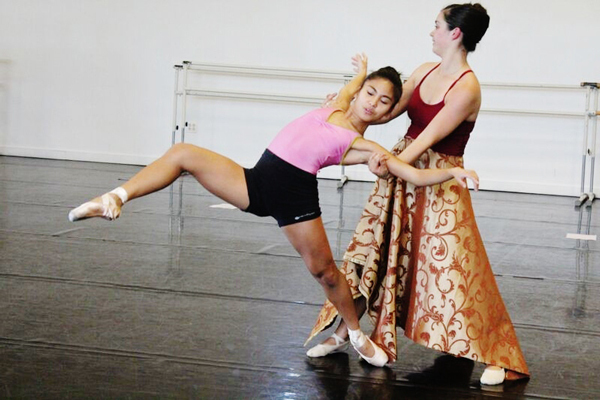 This is Concetta’s second commission by Arch Contemporary Ballet. 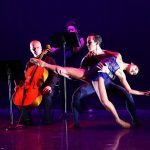 Arch Sound Ensemble is dedicated to carrying out Arch Contemporary Ballet’s mission to enhance the connection between ballet and music. Resident musicians hail from all musical backgrounds spanning an unlimited range of instruments and merit. 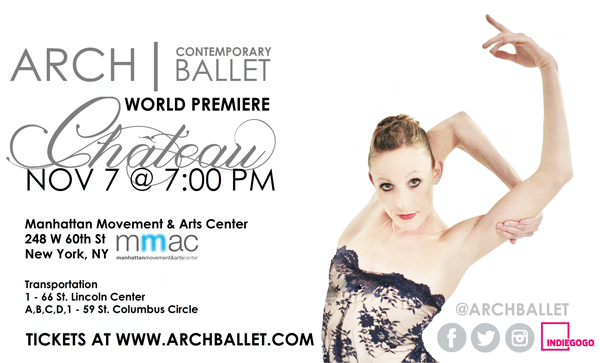 Dance Mogul Magazine takes a closer look behind the scenes of Arch Contemporary Ballet (Exclusive Interview). DMM: What inspired the current piece? Arch Ballet: I was inspired by two concepts, first architecture and second the history – behind Chateau de Fontainbleu in Northern France. The long corridors and chambers that were renovated by different ruling eras played a huge part in the conception of this new work. The musicians act as the never ending walls of the Chateau, and the dancers reflect current and past generations. DMM: What do you hope audiences take away from it? 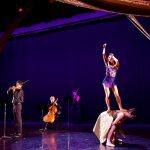 Arch Ballet: I wanted the audience to get lost in the different rooms of the Chateau, and get lost in the rich history behind Chateau de Fontainbleu. There are several stories and nuances that are reflected in this piece based on history, but I leave that up to the audience to decide how to perceive it. That is why I have not put a synopsis in the program! I loved hearing the audiences thoughts after the show about all the stories and plots they were guessing, most observations were spot on to my intent with a little spin to it. I want the audience to let their imagination run wild, and usually these thoughts are reflections of stories from their own lives and that’s what I want – the audience to take a piece of the work and find a piece of them self in it. DMM: How did you and the cast prepare? 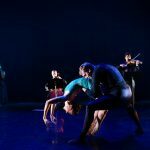 Arch Ballet: We began working on the piece around February of 2015, taking a hiatus for touring performances in the summer, and started back up in the beginning of Fall. All of my works are created in silence first, so the cast learned the final product completely to no music. Our next step was creating the music with our commissioned artist, Concetta Abbate. I gave her guidelines and the areas I really wanted to accent, and she used those guidelines to create a new music score for a string quartet. This process is usually done by giving her the full length video of the piece so she can use it to create the music. She often described in her process as creating some parts to be played to be more of a background movie scene, and some parts are meant to accent the dancers specific movement and gestures. 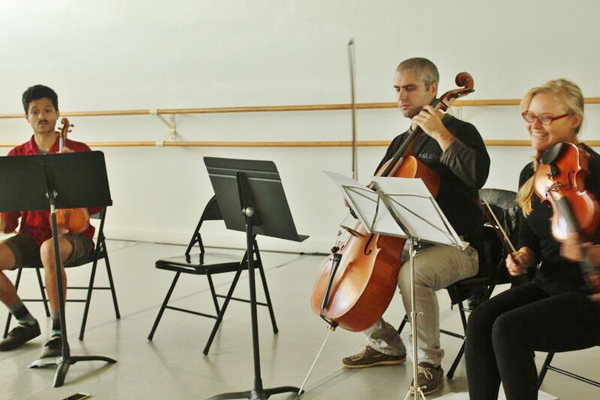 After her score is complete we bring in Arch Sound Ensemble to play the new score. 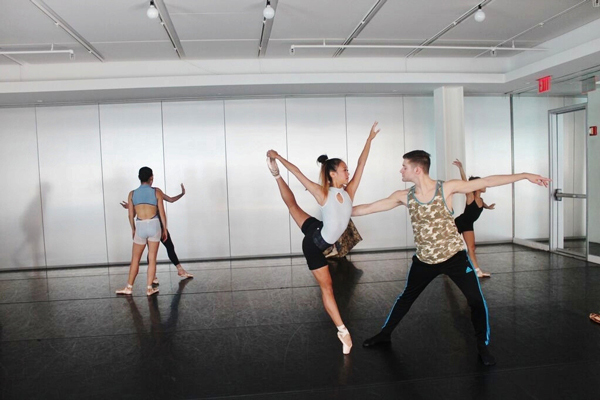 The dancers have to then learn the music on top of already learning the choreography! In this work the musicians also had choreography moving about the stage acting as the walls of the Chateau for the dancers to explore. DMM: What are some projects you have planed for 2016? 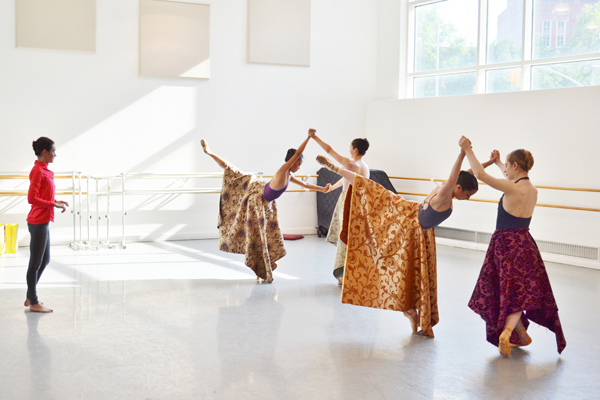 Arch Ballet: In 2016, we will be premiering a new work – which I can’t tell you too much about just yet! But I can give you that the concept is based on how everything in this day and age can be replicated. We will be incorporating a lot of different technologies, in all elements of the production, from costumes to music to lighting and even the backgrounds. DMM: Is there anyone you would like to thank for helping you on this production ? Arch Ballet: A huge thank you to my entire team – dancers, musicians, tech crew, photo/video crew, interns, and of course MMAC. This work was a triumph! 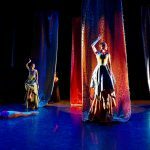 For a small but rising ballet company, 100 yards of fabric weighing about 150 lbs, a new music score, live music, moving musicians on stage, women lifting women, and 12 dancers is no easy task! A huge thank you to my right hand woman, Adrienne Riter – one of the original members of the company, she consistently challenges me when needed and has seen the growth of the company as we expand even further into 2016. Additionally, none of our efforts could be possible without our growing support of our patrons, fans, and dance community. 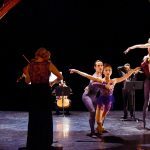 You can continue to support ACB by checking us out at Archballet.com/Support.